Feeling a little more sluggish than usual? Has life gotten the better of you? If so, life balance bracelets might just be the perfect option! But what’s a life bracelet, you ask? Generally, these types of wristbands are made with magnetic or negative ion technology and assembled using silicone bands or stones. They may also be available in leather or even as a watch! And in some cases, both technologies may be used. According to historical usage and scientific evidence, the benefits of negative ions and magnets may include: enhanced energy and endurance, reduced inflammation, stress relief, better sleep, and so much more! Where Can I Buy My Own Balancing Wristband? If you’re interested in seeing for yourself the incredible restorative effects that thousands of energy band wearers report every single day, make sure you only buy a wristband that’s been extensively tested for potency. Unfortunately, some companies use cheap magnets or minerals that don’t generate enough negative ions. The result? You might have a nice-looking bracelet but it’s functionally useless! 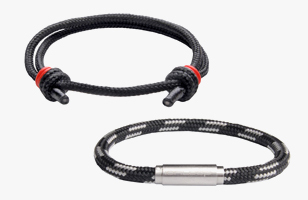 At IonLoop, we craft only the highest-quality bracelets available on the market. And we test all our bracelets for magnetic and negative ion potency to ensure you’re getting only the best in therapeutic potential. Do Life Balance Bracelets Really Work? It’s a question we get asked all the time… do negative ion bracelets work? The truth is, there’s been a large amount of studies performed on the benefits of negative ions. In fact, these little molecules have been under the microscope since the 1930s. Even companies like WebMD have acknowledged that negative ions may help improve mood. But despite the significant number of studies on the subject, health authorities and government agencies do not yet have an official stance on their use. Regardless, people all around the world are continuing to report positive effects from their wristbands.